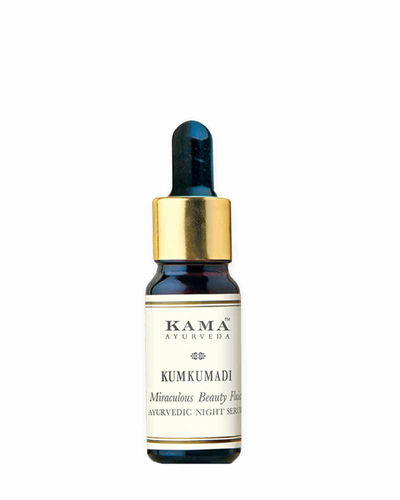 An Ayurvedic night serum made with the legendary Kumkumadi oil prescribed for dull, pigmented, damaged and aging skin.Prescribed in Ayurveda for glowing complexion and even skin tone. This unique blend of oils and herbs is formulated to help skin look young and healthy. In Ayurveda, rare pure Saffron helps illuminate the complexion. Extracts of Indian Madder and Banyan tree help smooth fine lines and repair early signs of ageing. Sandalwood, Vetiver and Lotus have a cooling and cleansing effect while clearing blemishes. Liquorice, an antiseptic, protects against bacterial and fungal infections and also helps improve skin texture. Explore the entire range of Night Cream available on Nykaa. Shop more Kama Ayurveda products here.You can browse through the complete world of Kama Ayurveda Night Cream .